One of the iconic cottage garden perennials, yet with origins far away. 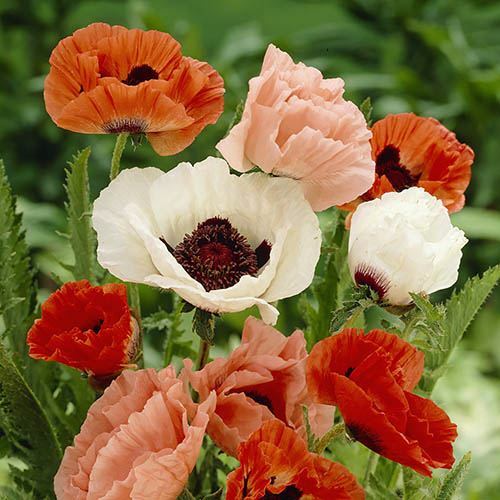 The classic large flowered Poppy with its characteristic black blotch in the centre, followed by statuesque seed heads that add longer season interest, are a real low maintenance, easy plant. Best started from bare roots in autumn and earty spring, this mix of shades will include reds, oranges, pink and whites, and more. Be bold and plant them randomly, or if you prefer to see what colour they flower, grow in a 15cm (6') pot for the first few months, and see what shades you get. A very tough, hardy and robust prernnial, dies back under ground each winter, and emerges bigger and better for years to come. Supplied as a mix of 5 mixed colour bare root plants, to plant in Autumn and early Spring, as this gets best establishment, and earliest flowers in first year.